When looking for the best shop vac out there, you’ve got to go through tens of products before settling on one. 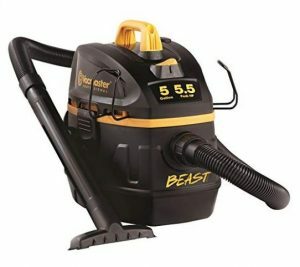 There are many good wet/dry shop vacuum cleaner models, but which one should you buy? Today, we take you through our top 10 picks. Apart from the obvious fact that shop vacs make work a lot easier, there are other critical factors to consider. These are capacity (Gallons), airflow (CFM), and suction power. Ultimately, you want one that is effective in what it’s supposed to do – getting rid of tough dirt. Other factors to consider include storage and whether the vacuum comes with extra tools/accessories. Ideally, shop vacs are used for heavy-duty cleaning tasks that involve water, metal pieces such as screws and nails, sawdust or wood in construction sites, garages and woodwork shops. However, they can still be used at home or in cars for a more thorough cleaning. (Editor's choice) 12 Gallon 5 HP 12 ft. 7 ft.
2. Craftsman 12004 6 Gallon 3 HP 17 ft. 7 ft.
3. Vacmaster VFB511B 5 Gallon 5.5 HP 18 ft. 7 ft.
4. Armor All AA255 2.5 Gallon 2 HP 10 ft. 6 ft.
5. 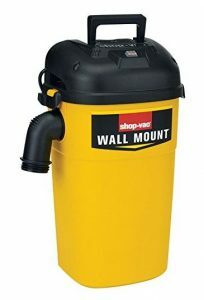 Shop-Vac 5989300 5 Gallon 4 HP 18 ft. 6 ft.
6. 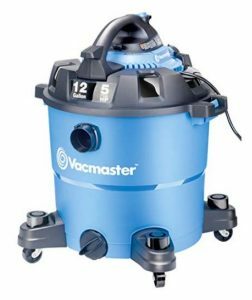 Vacmaster VQ607SFD 6 Gallon 3 HP 12 ft. 7 ft.
7. 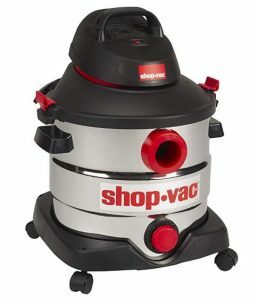 Shop-Vac 5895200 2.5 Gallon 2.5 HP 18 ft. 7 ft.
8. 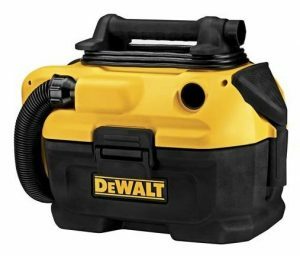 DEWALT DCV581H 2 Gallon 1.85 HP 5 ft. 5 ft.
9. Stanley SL18136 3 Gallon 4 HP 10 ft. 5 ft.
10. Shop-Vac 5989400 8 Gallon 6 HP 12 ft. 7 ft. 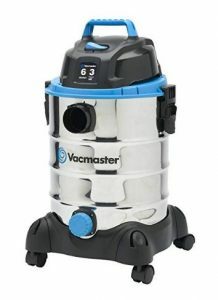 The Vacmaster VBV1210 is recommended as the best shop vac 2019. This shop vac is powerful enough to tackle the most difficult cleaning task. Moreover, you can easily convert it into a detachable blower if need be at the press of a button. So, if you are looking for a powerful cleaner that will outdo your regular vacuum at home, then this won’t disappoint. Also, it is great for workshops and garages as well as when you are doing repairs at home. As mentioned above, you can conveniently use it as a leaf blower in your yard. 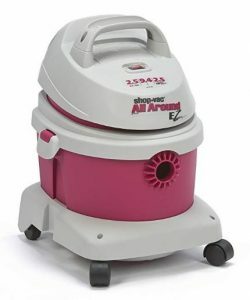 Its 12-Gallon capacity should be enough to take care of most cleaning tasks. Also, the vacuum comes with an array of attachments that make work easier. These include a crevice tool, 2 extension wands, car nozzle, blower adapter, 8-inch utility nozzle, blower nozzle, air/noise diffuser, reusable foam filter sleeve, and a standard cartridge filter. Click here to see the current price of the Vacmaster VBV1210. Whereas the Craftsman 12004 is not as powerful or as big as our top pick, it does pack a punch. It is fantastic with medium messes in the shop, basement or garage as well as small ones at home or in cars. You can also easily convert it into a blower to take care of your backyard. It is a bit smaller in capacity and doesn’t come with as many attachments as we would like. However, it does a brilliant job overall. For its modest price, it will certainly give you the best bang for your buck. The next Vacmaster shop vac in this list is not here by chance. It’s not called a ‘Beast’ for no reason. 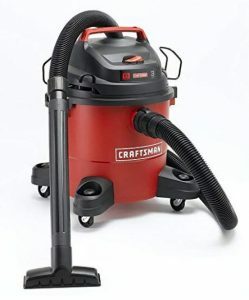 Boasting strong suction and powerful air flow, this wet/dry shop vacuum cleaner is great with tough tasks in the workshop or any job site, garage, cars, and also houses. Obviously, dealing with small messes is a breeze. Apart from having a wide range of accessories to deal with all kinds of dirt and debris, this shop vac easily converts into a blower. While it is naturally loud, this can be handled by a muffler that comes as part of the package. However, you are not supposed to use the muffler when blowing of leaves and the like. The accessories provided include a utility nozzle, car nozzle, crevice tool, one extension wand, foam wet filter, fine dust cartridge filter, and noise diffuser. Click here to find out how much this amazing wet/dry shop vac costs. This small, compact wet and dry shop vacuum is not only easy to carry around but also effective in its job. However, having only a 2.5 Gallon capacity and a 2 peak horsepower, don’t expect it to outperform the likes of Vacmaster VBV1210. Whereas this vacuum can get rid of both solids and liquids in the garage, workshop or the house, it is most recommended for cleaning car interiors. Also, if you need to clear leaves and other light dirt off your patio or yard, you can quickly convert the Armor All AA255 into a blower. At just less than 50 bucks, you can get your hands on this little champ. Click here to find out how much this little guy costs. This is another powerful shop vac worth a look. It has a strong 4 peak HP motor that helps to deal with all kinds of messes efficiently and effectively. The advantage with this unit is that it can be mounted on the wall so convenience. So, cleaning your basement, garage, workshop, car interiors or even your living room floors becomes a walk in the park. Also, expect to tackle all kinds of heavy duty to smaller dirt and debris with ease thanks to the accessories available. These include 1.25-inch diameter extension wands, a 12-inch nozzle with brush and squeegee, gulper nozzle, crevice tool, round brush. Other accessories also available include a collection bag, foam sleeve, cartridge, and a tool storage bag. Even though it is rated as 3 peak horsepower, the Vacmaster VQ607SFD is powerful enough to handle most kinds of tough dirt in your basement, laundry room, workshop, garage, and the floors in the house. Apart from the more or less common 6-Gallon tank capacity, the VQ607SFD has other advantages. First, it has wheels that make it easy to push around as you clean. Also, its balanced top handle design makes it easy to carry from one area to the next. Secondly, the stainless steel makes for an attractive appearance as well as prolonging its lifespan. Just like other Vacmaster wet/dry vacuums, this one also comes with an array of accessories to make your work easier. These include air control nozzle, multi-surface floor nozzle, crevice tool, 2 extension wands, 2-in-1 utility nozzle, round dust brush, standard cartridge filter, and a reusable foam sleeve. A dust bag is also included. Not as powerful as the Vacmaster VBV1210 and the Vacmaster VFB511B. Click here to find out the current price of this wet-dry shop vac. This is the smallest Shop-Vac unit in this list, but this compact cleaner’s capability justifies its place in this review of the best shop vacs. This unit is very easy to handle while cleaning. At only 12 pounds, it’s easy to carry around by the handle. Also, you can roll it on the wheels from one location to the other. 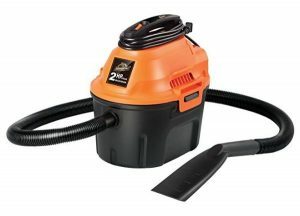 Even though the 2.5 Gallon capacity is quite small, the shop vac can tackle hard messes in the garage, laundry room, workshop, household, and car interiors. Also, it comes with multiple accessories including a wall-mounting bracket. This makes it easy to store the cleaner, especially in tight spaces. Other accessories available include two extension wands, bare and carpeted floor nozzle, crevice tool, gulper nozzle, foam sleeve, round brush, and a filter bag. The DEWALT DCV581H is another compact shop vacuum that warrants its place in any best shop vac review. Unlike most of its competitors, this wet-dry shop vac uses a HEPA filter. HEPA filtration is known to trap up to 99.97 percent of allergens. So, this is a welcome option for anyone fighting allergies. Versatility is the name of the game here. This vacuum can be used as a corded or cordless unit. You can either connect it directly to power or use an 18v or 20v MAX battery. This is very critical if the area you want to vacuum is a bit far from the power outlet. It is also useful when dealing with car interiors. However, the battery and charger are usually sold separately. Also, the build is heavy duty so as to withstand the occasional falls. Unlike most shop vacs, this one comes with only 2 attachments – a crevice tool and a wide nozzle tool. Click here to find out the current price of the DEWALT DCV581H. 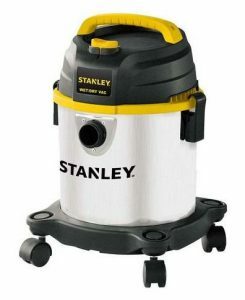 The Stanley SL18136 is a lightweight, compact shop vacuum that is quite easy to use and move around. If you need to carry it from one point to the next, the top handle comes in handy. Also, you can roll it along the floor easily because it has swiveling casters. Thanks to a strong 4 horsepower motor, the vacuum is powerful enough to handle even the toughest dirt in workshops, garages, basements, and laundry rooms. Despite the fact that shop vacs are designed for very difficult jobs, this shop vac also does an excellent job clearing solid and liquid messes in houses and car interiors. Double filtration ensures that most pollutants and allergens are not allowed back into air circulation. So, this leaves the place clean and fresh after every round of cleaning. Lastly, apart from a 5-foot hose, the vacuum comes with quite a number of accessories to make the work easier and thorough. These include three extension wands, floor brush, crevice nozzle, gulper nozzle, foam filter, reusable filter bag and a cloth filter with a clamp ring. The third and final Shop-Vac cleaner to appear on this review is the 5989400 model. Just like its kin, this wet/dry shop vacuum has also been produced by one of the industry’s leading manufacturer. Similar to the Shop-Vac 5895200, this one can also be converted into a blower using the rear blower port. Even though it is slightly heavy, the compact vacuum can easily be carried around using the top and side handles. Also, with a tank that can hold up to 8 Gallons, it is large enough to easily take care of bigger tasks in the shop, garage, basement, laundry room or in the house. Apart from the long hose, this shop vac has other accessories. These include three extension wands, crevice tool, floor nozzle, gulper nozzle, cartridge filter, foam sleeve, and a filter bag. Click here to see how much the Shop-Vac 5989400 costs. A good shop vac should be able to deal with all kinds of messes, from the smallest to the toughest. Apart from the powerful suction, we would advise that you get one that can take care of both solids and liquids. Thankfully, all the shop vacs reviewed here have the capability to clean wet and dry messes. So, whichever you pick should do a good job. Whether you are looking for an apartment vacuum or one for tough jobs, wet/dry shop vacs will get it done. Another thing you need to consider is the amount of dirt you have to clean up – whether it’s sawdust collection or sucking up water. Larger quantities (especially of water) demand larger tank capacities. The shop vacuum cleaners we recommend as the top 10 range from 2 Gallons to 12 Gallons and should give you a good range to pick from. Lastly, if you have any feedback or question regarding shop vacuums, feel free to let us know in the comments section below.